Google's newest UK Campus, located in the Silicon Roundabout in Shoreditch, is an experiment in flexible working environments to accommodate a shifting workforce and start-up companies. Designed by London-based Jump Studios, the seven-story building has been stripped of its original finishes and renovated with shipping container rooms, open plan work spaces, lockers, social spaces, and a cafe for both Google employees and guest start-up firms. Reclaimed decor, playful finishes, and simple plywood furnishings complete the look in this quick-paced hub of activity. Google Campus is a seven story co-working and event space in the center of London’s tech hub, otherwise known as Silicon Roundabout. 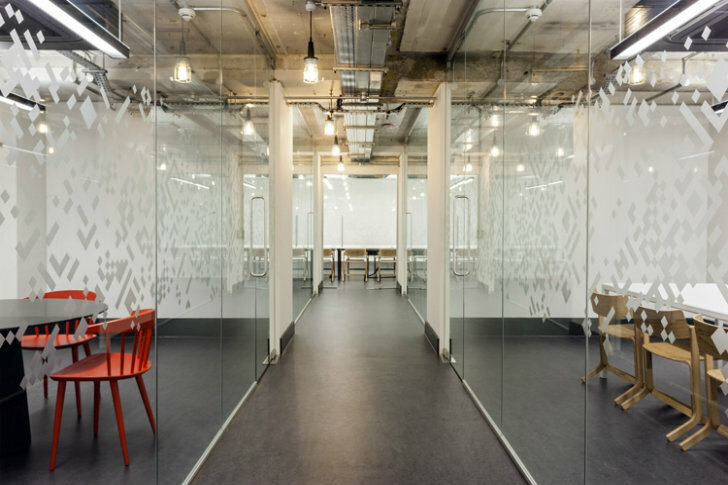 The co-working facility provides office space for Google employees and space to support London’s start-up community. The facilities host event space, social areas, meeting rooms, and presentation theaters to facilitate discussion, business, and education. Everyone in the building can enjoy the rooftop deck, the moss-covered courtyard, 40-bicycle parking area, a cafe. and communal meeting areas. In the upper floors, Google employees enjoy a dynamic and flexible working environment with a variety of working options from open tables, private desks, lockers, hot desks, and formal and informal meeting areas. Shipping containers sit in the middle of the space and hold work spaces and kitchenettes. 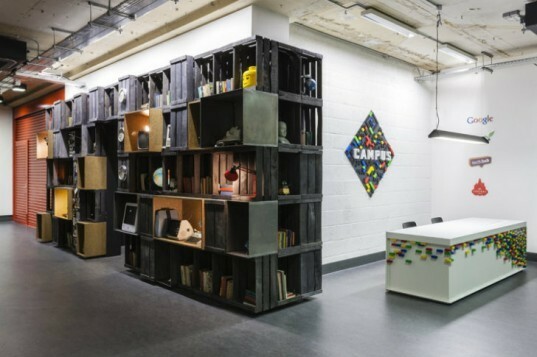 Reclaimed fruit crates are used as shelving and exhibition space in the reception area, and LEGO bricks are used on the front desk. Industrial and low-tech decor, like plywood furniture, dominates the office, creating a strong sense of place and allowing the environment to easily be adapted as needed in the future. Google Campus is a seven story co-working and event space in the center of London's tech hub, otherwise known as Silicon Roundabout. The co-working facility provides office space for Google employees and space to support London's startup community. The facilities host event space, social areas, meeting rooms and presentation theaters to facilitate discussion, business and education. Everyone in the building can enjoy the rooftop deck, the moss-covered courtyard, bicycle parking area for 40 bikes, a cafe and communal meeting areas. In the upper floors, Google employees enjoy a dynamic and flexible working environment with a variety of working options from open tables, private desks, lockers, hot desks, and formal and informal meeting areas. Shipping containers sit in the middle of the space and hold work spaces and kitchenettes. Reclaimed fruit crates are used as shelving and exhibition space in the reception from and Lego bricks are used on the front desk. Industrial and low-tech decor, like plywood furniture dominate the office creating a strong sense of place and allowing the environment to easily be adapted as needed in the future. The Google Campus offers a variety of meetings spaces. Google work spaces with glass walls to connect employees together and allow more daylight. Stairwell and rooftop deck at the Google Campus.